Welcome to Power Pet's. Have any of your pets received any honors, awards, or do any of them come from a champion bloodline? Well, if the answer to that question is no, don't worry. You see at At Power Pet's we provide you the opportunity to showcase your blue ribbon or none championship winning pet to the world. Just maybe there might be something that the world doesn't see or know about your precious pet. 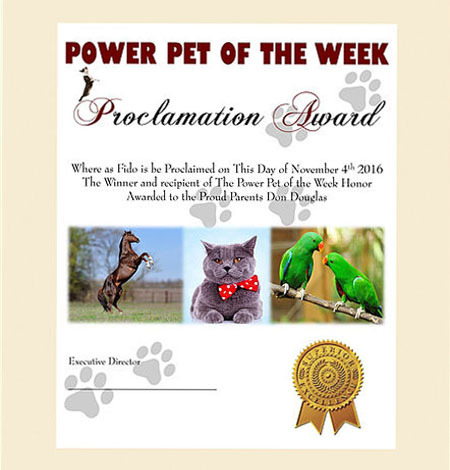 You see, at Power Pet's all are given the chance and opportunity to be the coveted Pet of the Week, Pet of the Month, or even the honored distinction of being named Pet of the Year in our online publication and printed registry. While on his daily travels throughout the neighborhood, our founder discovered his neighbors would proudly keep him updated on the personality traits and newest skills of their pets. It became obvious to him that the pride they had for their pets was the same as a proud parent would display for their own children. That is why he decided to find a way for fellow pet lovers to share their pets and pet stories to the world while competing for the highest designation and honor their precious pet could ever achieve. When you nominate your pet and should they become the lucky recipient of pet of the week, month and even pet of the year, a beautiful color photo of that pet will be displayed along with the winning pet's story and criteria that pet was chosen by. On our website, also you will be able to acquire our pet gear such as our beautiful Power Pet clothing line and Power Pet winner accessories that your pet can wear and you can show off and bask in your winning pets success. We are aware that there are numerous varieties and breeds numbering in the hundreds, so the standard for most kennel shows is to go by the acceptable norm, such as color, coat, size, ear shape, placement, tail, and even feet. Well, we look at each pet individually as you would and not as part of a group, breed, and category. After all, as a parent, there is something you see that other's may not. We are driven to recognize what other's don't see, whether it be a dog, cat, horse, bird, or even a ferret, we strive to recognize the best attributes of your pet. Show off your unique pet!